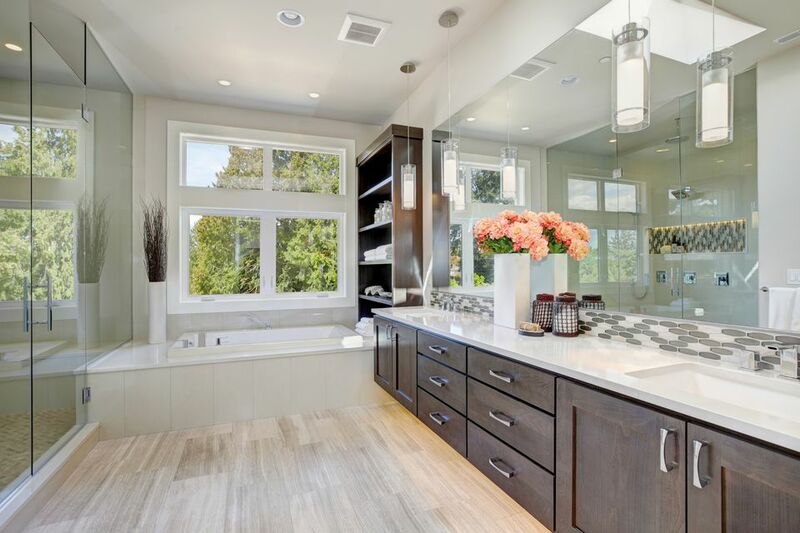 Remodeling a bathroom averages a 60%-65% return on investment. Some homeowners report recouping over 100%. How can you turn your bathroom into a top contender? Go beyond the standard and add unique features that will stand out to buyers–features they never knew they wanted and won’t want to live without. Tubs are pretty basic and often left out of remodeling plans except to be replaced by saunas for large, modern showers. This neglected canvas is a big opportunity to make a statement. You can apply panels, tiles or veneers to complement your theme and add luxury. Accomplish looks as sophisticated as white beadboard and as rustic as natural stone. A bathtub, such as the one shown above, by Erin from Sunny Side Up, can be a huge selling point. If you’re on a tight budget, consider manufactured veneer or composite materials. With manufactured stone veneer, you can give your tub a DIY makeover for less than $100. Like tubs, doors come standard. The average upgrade involves scrubbing, painting and installing new hardware. Your bathroom door won’t make your home more memorable–unless you take it to the next level by installing a barn door. Barn doors, like this from Shauna at Beautiful Matters, are continuing to trend. They are a beautiful, easy-to-install design piece and save space. Wood is the most popular material to find bard doors in, hanging from dark iron tracks and hinges. For homeowners with a uniquely modern style, you can also find barn doors in all kinds of glass. Opaque or ombre colors offer a contemporary edge to this extremely popular trend. These doors and their hardware can cost $800-$2,000 each. If this sounds like too much money for too little impact, consider this: a Zillow report shows that homes with barn doors sell up to 13% above asking price. The right tile can beautify a bathroom, but faux wood can turn up the spa appeal as shown in this shower from Wendi at H2O Bungalow. Elements of nature–faux though they may be–have a calming effect. This is why many spa designs incorporate wood, greenery, and water. These tiles are also a great way to unify your home design. Using flashes of consistent material from one space to another is a designer secret, and faux wood is one of the most popular tiles in the industry. Incorporate wood accents in each room on varied scales for a unified atmosphere. Faux-wood tile can be as affordable as $1 per square foot, but typical hardware stores stock a range of $2-$13 per square foot. Laminate sinks are boring and don’t motivate buyers anymore. But if you’re happy with the layout of your bathroom vanity, what can you do to give it an edge without replacing it? Aside from painting the cabinetry and updating the mirror and hardware, take an afternoon and cover that laminate with a concrete overlay, like Tasha did at Designer Trapped. With a concrete overlay, there are practically no limits. Some homeowners install concrete finishes for a raw, industrial feel while others use additives and pigments to create marbled or speckled finishes. You may feel a tad irresponsible slathering concrete all over your counter, but follow the proper techniques, and you’ll have a brand-new sink you can be proud of. DIY experts say this project can cost as little as $20! 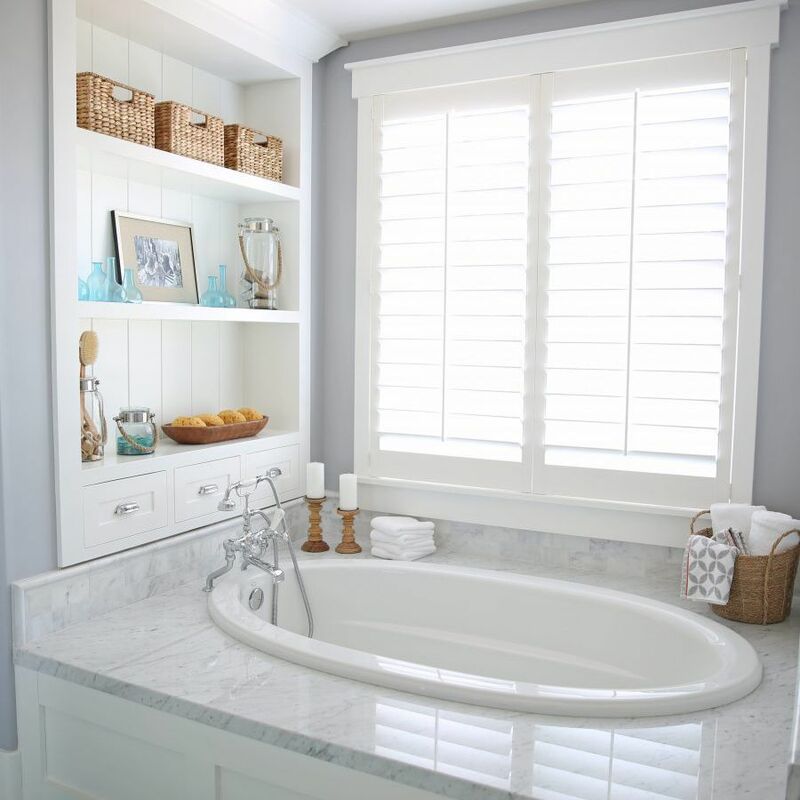 Bathrooms aren’t known for their ample storage, but homeowners could always use more of it, and buyers are certainly looking for it. If you only have a single vanity cabinet, consider using vertical space. Walls offer lots of opportunities for functional decor. Consider adding floating or open shelves, which take up minimal space and are trending in home design. Floating shelves cost as little as $3-$5 each. Plus they look amazing, as seen above from Ashely at Cherished Bliss. Upgrade the average features in your bathroom to create an entirely new space, rather than doing a complete overhaul. Minor changes like these can make a huge difference in a space so small. Whether you’re prepping your home for a sale or you’re just tired of staring at that laminate sink every morning, these remodel ideas are the perfect remedy for a bland bathroom.